Here’s a fun way to quickly pair students for activities, AND it exposes them more vocabulary without any effort at all. 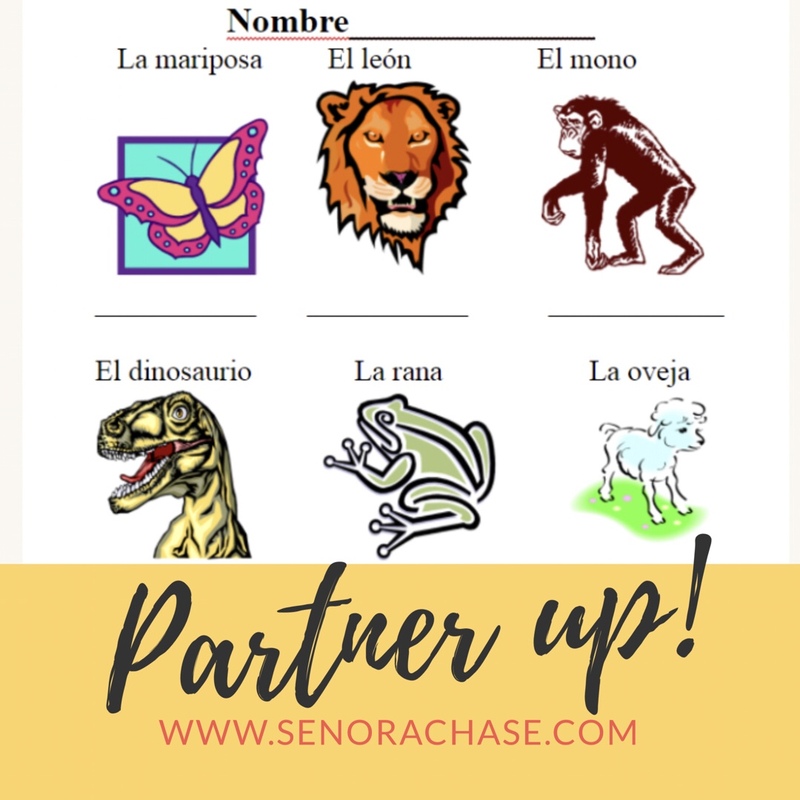 Typically we use Animal Partners, see links below… but for the month of October we have Compañeros de monstruos and Compañeros navideños in December. The cool thing is you could make partner sheets with ANY vocab you’d like to give them more exposure to-Clothing! Professions! Food! Share with me what you come up with. Here’s a French Version to get you started, thanks to Meghan Stevens! Teacher Prep Before Class: Copy 2 different hojas de compañeros papers back to back, and hole punch both sides of the paper. Make enough copies for every student plus extras, because inevitably someone will lose their copy before they fill out the second side. I usually copy this on colored paper, since we use it so often. Pass out a sheet to every student and have everyone write their name on the top. Decide which side you will start with and only use that side (for now). Explain to students that they will have 9 new partners, one for each picture. So, for example, if Susi and Ana want to be “Compañeras de pato”, Susi will write Ana’s name below the duck picture and Ana will write Susi’s name under the duck. Give the students 3-4 minutes to fill in their sheet, and instruct students to sit down when they’ve filled their sheet with 9 different partners that they will be able to work well with. After a few minutes instruct everyone to sit down, and then go through each picture to make sure everyone has a partner (This step is crucial and only takes a few moments.) The teacher starts with the first picture and asks something like ¿Quién necesita un compañero de__________? Students needing that particular partner raise their hands and the teacher quickly assigns partners, for example, the teachers says“Julio y Carolina”, so Julio writes Carolina’s name and vise versa. If there is an odd number of students, or someone messed up (which may happen, it will work out), you will have 1 student without a partner. Simply tell that student to write “Alternativo/a” under that drawing and move onto the next animal. Hey visual learners, here’s what this looks like. Teach students to quickly move to that partner. Students whose partner is absent or is the alternate should go to the teacher. The teacher quickly pairs those students or makes a group of three, if there is an odd number of students. I use each sheet for about a month, then on a day when most (or even better, all!) students are present, I’ll ask them to take out their Hoja de compañeros, flip it over (Since you hole punched both sides, they can now have the correct side up in their bunder) and have them fill in their new Hoja de compañeros. After we’ve used both sides, I ask the students to move it to the vocabulary section of their notebooks and I pass out a new Hoja de compañeros. If a student is absent when you set up the animal sheet, you must make a sheet for him or her, or else they will not have a partner and you will feel awful every time you tell them to take out their Animal Sheet. Trust me. There are two ways to do this:If there is only 1 or 2 absent students, I will write their names on the papers and I will announce that if the students would like to work with Alberto or Julia, they should come to me and I will fill out the papers for Alberto and Julia. After we have done Hojas de compañeros a few times, I will write the absent student’s name on the paper, and magnet it to the board, instructing students that if they want to work with Alberto or Julia, to fill out their paper and their partner’s paper with their own name. Don’t be too anxious to get started with Hojas de compañeros the first week or two of school. Wait until all the schedule changing mayhem has settled. I learned this one the hard way! If a student moves into the class mid semester, just instruct them to come to you when you announce that students need to take out their Hojas de compañeros they should come to the teacher, who can quickly pair them up with a student whose partner is absent. Have extra copies ready when you fill out the second side, as there will be a few students who need a new one. Trust me. There’s always one. Or five. For the partner sheets – one suggestion is to have the students who can’t/didn’t fill in a slot to write “go to”. Because, inevitably, someone will be absent when you do the partnering. That way, Julia, who’s partner is absent, can “go to” Lucas who didn’t get someone written down on that day’s animal. I’ve tried using these partner charts before and have experienced the pitfalls you’ve mentioned here! I especially like the idea of changing them to teach “category” type vocabulary that doesn’t necessarily get explicitly taught in a CI class! What a FAB idea!! Thank you for sharing!